NASA’s ARTEMIS mission has two probes circling Earth’s nearest celestial neighbor. They’re gathering high-fidelity measurements of miniature shock waves taking place on the moon. SSERVI DREAM2 physicist Jasper Halekas is the deputy principal investigator on the mission. Photo credit: NASA/ John Moore. The sonic boom created by an airplane comes from the craft’s large, speeding body crashing into molecules in the air. But if you shrank the plane to the size of a molecule, would it still generate a shock wave? Jasper Halekas, physicist on SSERVI’s DREAM2 team and deputy principal investigator of the ARTEMIS mission, hopes to answer that question by studying miniature shock waves on the moon. These sonic boomlets, physicists believe, are being generated by protons in the solar wind—moving at supersonic speed—colliding with pockets of magnetic fields that bubble up from the moon’s crust. Halekas reported on the development of collisionless shocks from supersonic solar wind colliding with magnetic anomaly regions at the 2016 American Geophysical Union fall meeting in San Francisco. Halekas discussed new findings on the physics underlying the moon’s mini shock waves in his talk, “Kinetic Interactions Between the Solar Wind and Lunar Magnetic Fields,” on Dec. 14. The findings come from NASA’s ARTEMIS mission, where two probes circling Earth’s nearest celestial neighbor have been gathering high-fidelity measurements of the shock waves. The moon’s magnetic fields first were measured by astronauts beginning with the Apollo 12 mission in 1969. Their portable magnetometers recorded magnetic intensities that varied by location; yet, the highest recorded result was just 1 percent the magnetic field strength on Earth. 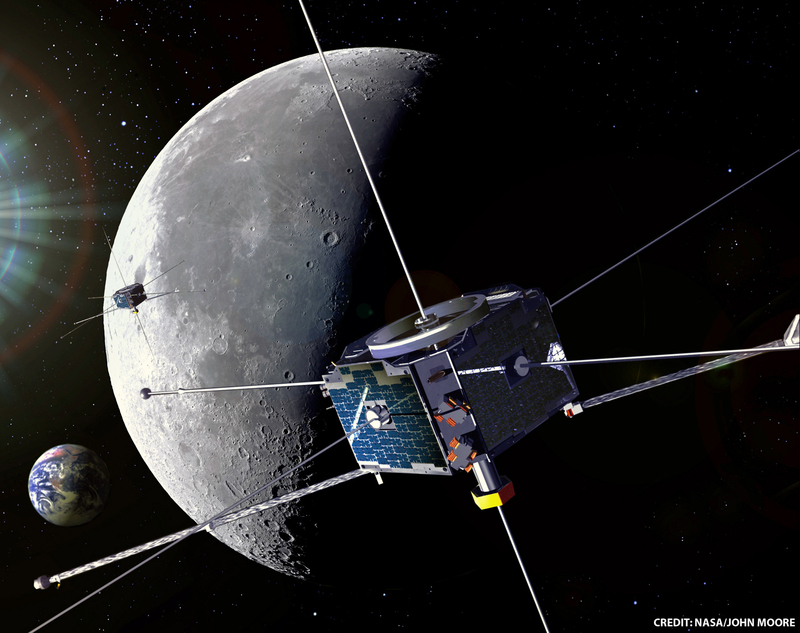 Despite the fields’ weakness and small size, spacecraft since then have documented the solar wind–magnetic field collisions, called “limb shocks,” at the boundary between the moon’s light side—the side facing the sun—and its dark side. Those collisions produce a reflected plume of sorts that radiates from the moon, similar to ripples on a pond. ARTEMIS has made 40 observations of the shock waves, Halekas says. Scientists want to better understand how these mini shock waves are created, as they may occur elsewhere in the solar system. For example, localized shock waves may occur as the solar wind blows by asteroids, Halekas says. It would be important to know about how it all works before trying to land astronauts on a zooming block of rock, as NASA has said it wants to do. The moon is a good place to study the phenomenon. 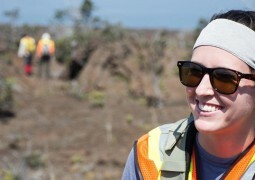 Kelsey Young from SSERVI’s RIS4E team discussed the Future of Planetary Surface Exploration at the Library of Congress.